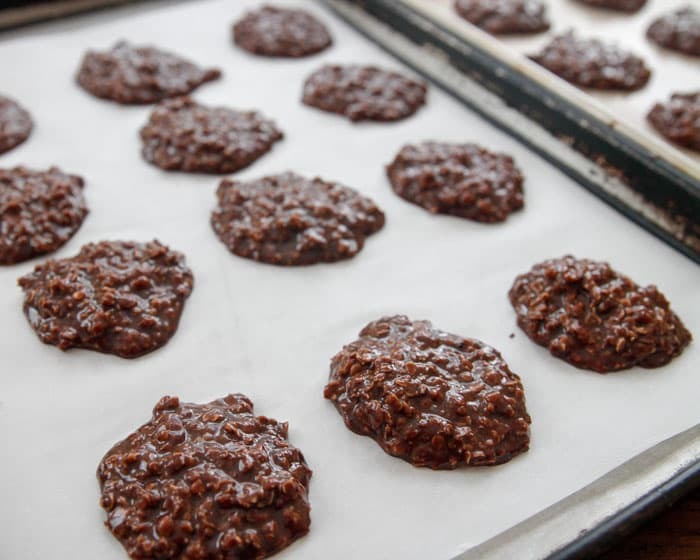 Chocolate No Bake Cookies made with peanut butter, oatmeal and cocoa, an easy treat without turning on the oven. It’s no secret I love facebook. Not only can I keep up with people locally but I’ve able to keep up with people far away. One of those people is my cousin Mackenzie. She’s up in the Pittsburg area and of course I’m in Georgia. We can’t just drop by for a glass of sweet tea but we do get to chat on Facebook. During one of our chats, it came up about my Grandmother’s recipes. I don’t remember her cooking or baking, but she was know for it. To be fair, they had a dairy farm and as a proper tomboy, I was always out wandering the fields, in the barns or begging to drive a tractor. It was hard to keep me indoors when I was growing up. So back to the recipes. I mentioned that I wished I had gotten some of her recipes (I have my other grandmother’s cookbooks and many recipes) but none from her. Mackenzie replies that she has some of them. Copies, but in my grandmother’s handwriting. I assumed I’d have to wait a few days for her to find them. No big deal, but not 5 minutes later, here come about 20 recipes through messenger! 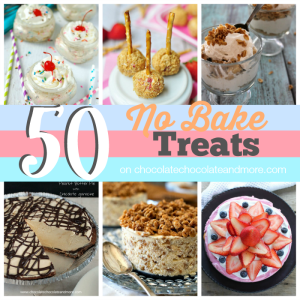 These No-bake Cookies were among them. Having all the ingredients on hand, I was making them an hour later. Such a simple recipe. I couldn’t wait for the kids to get home so they could have one of Grandma’s cookies. In a 2 quart saucepan, combine butter, cocoa powder, milk, sugar, and salt. Stirring constantly, bring to a rolling boil. Contnue boiling for 1 minute. 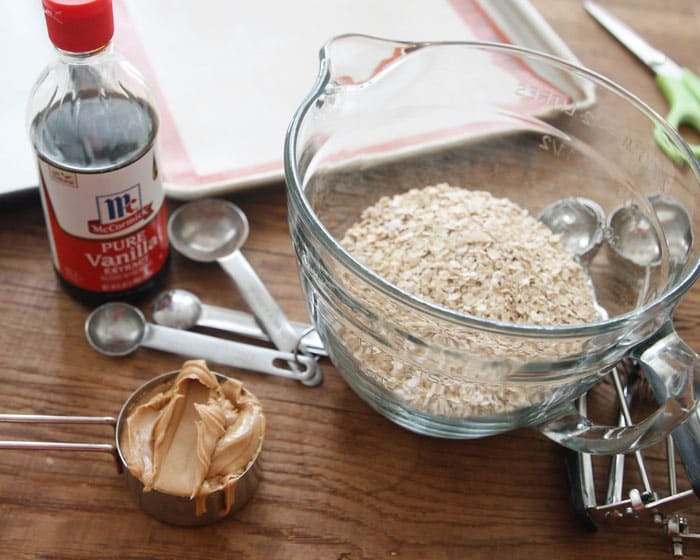 Remove from heat and stir in vanilla extract and peanut butter until smooth. Fold in oatmeal to coat. Drop by tablespoons (or use a medium cookie scoop) onto parchment paper (or wax paper) lined trays. Let cookies set up, 30-60 minutes, befre storing an in airtight container. I can’t wait to make more of her recipes! Sharing a piece of family history, one cookie at a time. 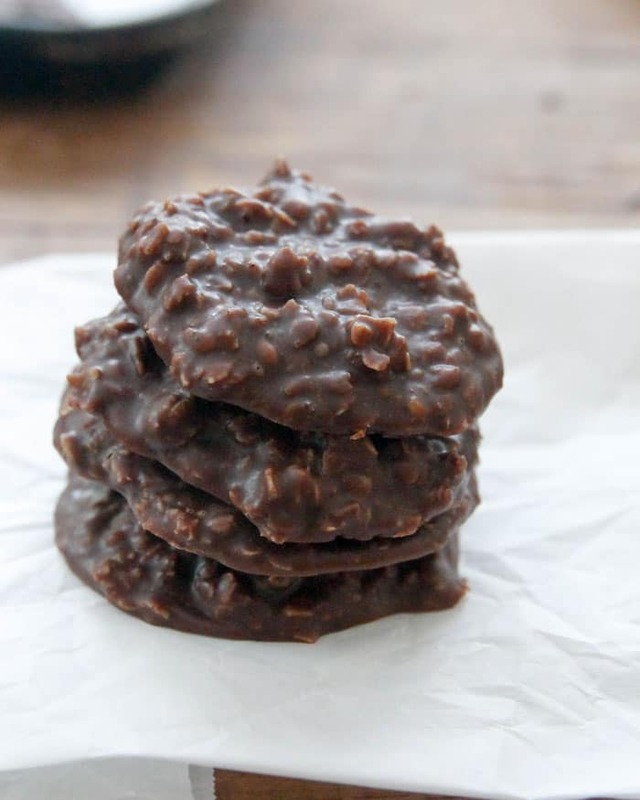 I make the chocolate no bake cookies all the time. My children always called them “rain cookies” because if it looked like it was going to rain or was raining the cookies would not set up and they really wanted me to go ahead and make them but I could not make them until the weather cleared up! 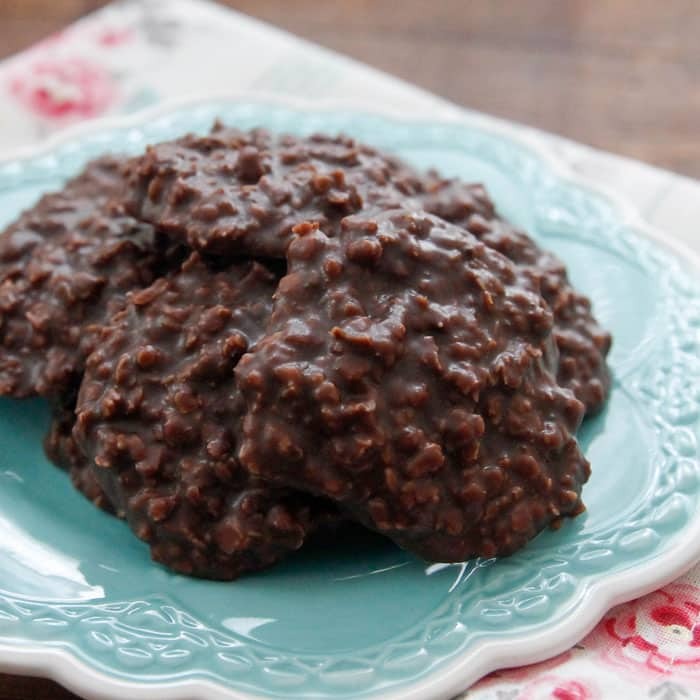 I should say, In making the Chocolate No Bake cookies, can I use quick oatmeal ? If not , why ? Thank you ! Yes you can use the quick oatmeal, the only difference is, the quick oatmeal is finer, less whole oats. I love facebook for the same reasons! I have so many friends and family all over the country . . how did we keep up with each other before Facebook?! 🙂 I still pick up the phone (because that’s important too!) but i love FB for the photos! seeing what my friends (and their kids are up to). . anyway, these are no-bake?! love! My mom and I have a variant of this recipe, which omits the peanut butter, uses shortening and adds shredded coconut to the oatmeal. This helps the cookie set up much faster. 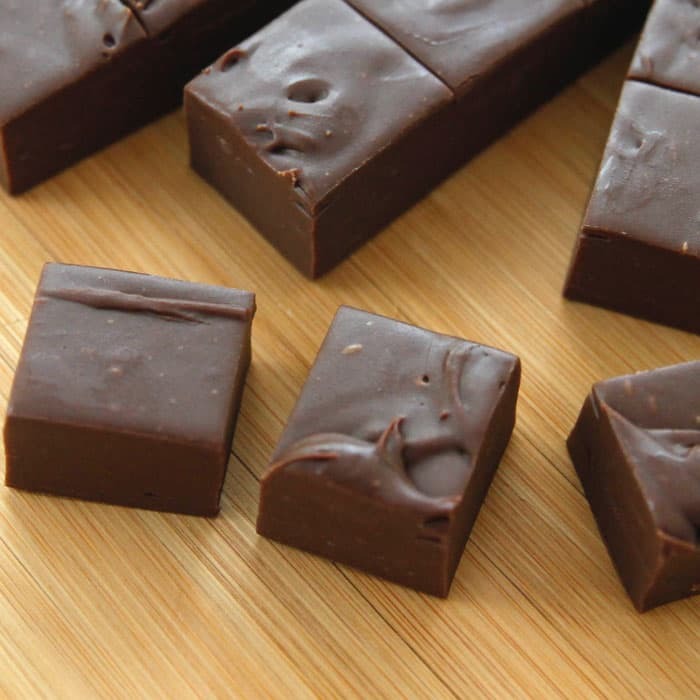 You could also try coconut fat (which is a hard fat) if you want to avoid the whole shortening thing. That’s the same reason I love Facebook: being able to keep in touch with friends and family all over the country, and all over the world. And also that I stumble on great pages like yours, with lots of recipes I’m sure will become favorites. How fun for you to get your grandmother’s recipes!! 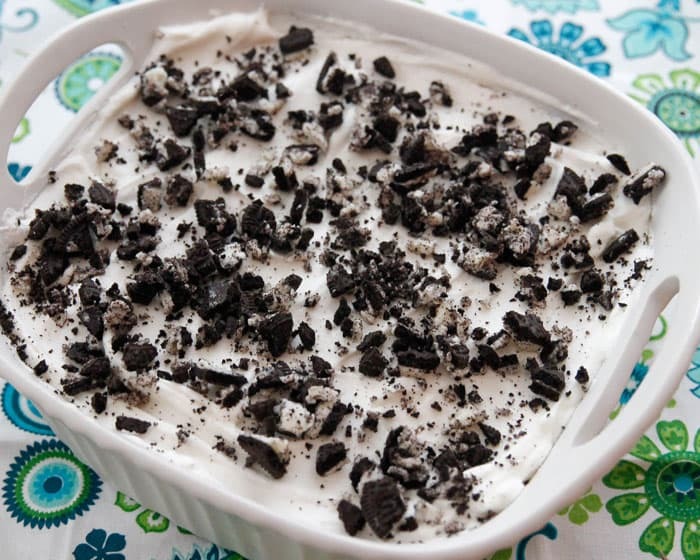 I saw this recipe this afternoon and here it is 2:30 am and I just made a batch an hour ago. I had all the ingredients and my mind wouldn’t let me rest til I made them. These are amazing! I made the right decision to not wait til morning. I just wish it wasn’t so humid. They took a while to set up firm. I’ll recommend this to my friends. Thank you for sharing. 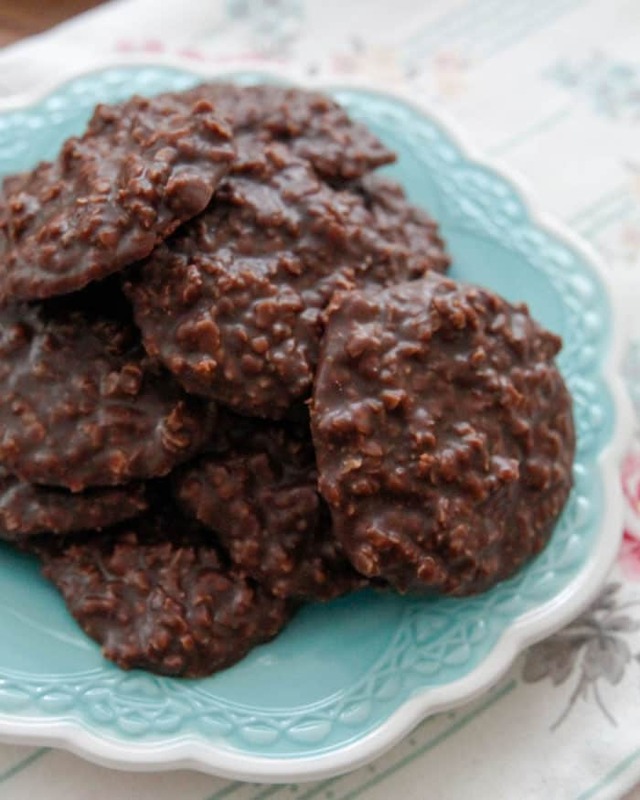 I copied all of my favorite recipes from my Mum just before I got married 40 years ago this month and one of those recipes was this same No-Bake cookie recipe except that we substitute 1/2 cup of the oatmeal for 1/2 cup shredded sweetened coconut. How can you go wrong with that much chocolate combined with peanut butter AND coconut!? these are my favorite. I just discovered a ‘healthier’ version using honey instead of sugar. but then found out sugar actually has less calories and carbs than honey. nevertheless, for me, there is not much difference in taste and they are amazing too. Thank you Susan, I’m happy you like them! Thank you Kayle, I hope you enjoy them! I would like to try them. Could you tell me the ingredients in gramms instead of cups? (I’m from Germany). Many thanks in advance! No worries Natasha! Just regular sugar. Hope you enjoy these — cheers! Can I substitute in almond butter? Can’t do peanut butter. Hi Sharlene, you sure can! I hope you enjoy these! Hi Joan, sounds like you live in a real nice place, I’m looking for a no bake cookie with oatmeal and peanut butter, but this one also has butter to give it that homemade cookie flavor, I know were gonna love em. You have so many yummy chocolate choices, I’m not sure which one to try first, but I guess I’ll start with these easy cookies. You sound like a person every woman would want for a friend and neighbor! Thank You! Carol, you are so sweet, you just made my day> Hope you enjoy these cookies. Hi Joan, I forgot to mention, I use the natural style unsweetened unsalted super chunky peanut butter, I can get the smooth, but I like the chunky peanuts. Can I just sweeten up the peanut butter with a little honey? Or maybe add a little more sugar to the mix, nice to know you can taste as you go, with no raw eggs in the mix. I know a lot of woman want to keep their sodium down, so I’m gonna see how these come out, I might have to tweak em a bit, but I’ll let you guys know how they came out. Thanks. Honey would be a perfect solution to sweeten these cookies. Let me know how your version turns out! Hi heather! 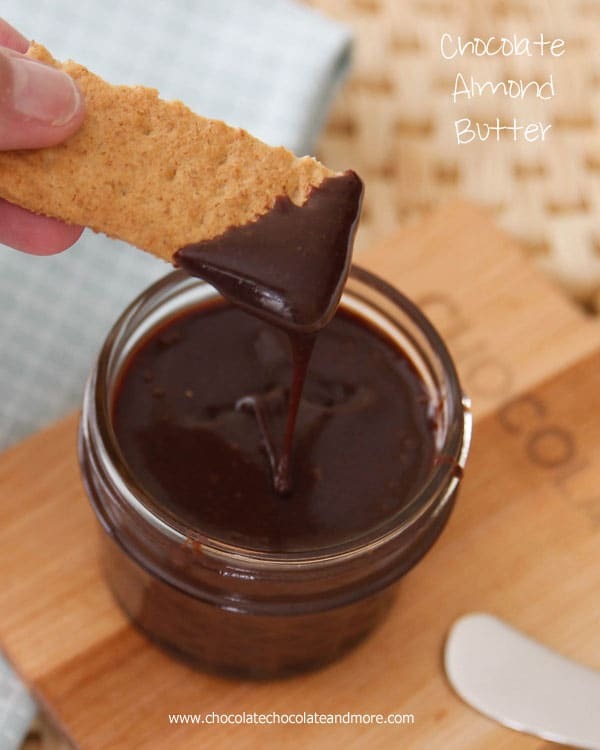 You can use almond, cashew or sunflower butter. I hope you enjoy these! Why does it say at the beginning that they have coconut in them? It doesn’t say coconut anywhere that I see, the first line mentions cocoa? Although, I have seen these cookies made with the addition of shredded coconut.